Starting July 1, Muni will legalize all door boarding on buses. Thanks to Clipper, all door boarding will be a practical solution and reduce boarding times further. 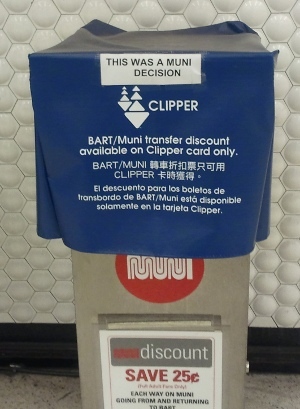 A 1 mph increase in Muni’s operating speed could save the SFMTA $76m a year. The SFMTA’s project to upgrade Metro fare gates has received an $11 million boost from the Fed’s stimulus package. The $29 million project to replace fare gates with cashless Translink-only gates will be moved up 1 and a half years for completion in the fall of 2010. Passengers will still be able to buy single rides by using fare machines similar to what BART uses and accept cash, debit, or credit to pay for a fare. Fast Passes will be accepted until they are phased out in favor of electronic monthly passes on Translink. You are currently browsing the archives for the Translink category.